All-Faith Weddings Q&A - ThirtySevenWest ThirtySevenWest - Creative ideas about personalized custom ribbons, woven tags and labels, personalized gifts and more!!! All-Faith Weddings helps make things easier for you and your wedding. A wedding is a turning point in your lives, and is celebrated with love, passion, happiness, joy, and excitement. They help make it a joyous occasion. Their goal is to make it a stress free day because the focus of this experience is love and unity. A: Our specialty is conducting meaningful wedding ceremonies, including inter-faith, inter-race, first and second marriages. Q: When do you suggest a couple meet with you? A: It is a good idea to meet with couples as soon as a wedding date is selected to save the date. Q: What else do you do at the meeting? A: If you’re ready to begin, we like to begin writing their unique ceremony so you have time to think it through. A: With All-Faith Weddings, you get high quality at a lower cost. 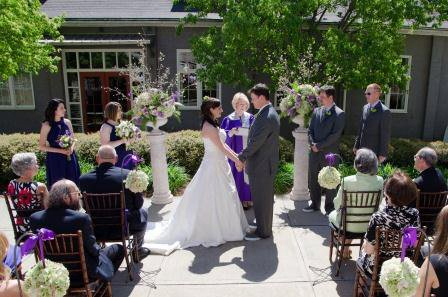 All-Faith Weddings offers ceremonies at an economical, conservative cost. Q: Is there a deposit required? When? A: We request a small deposit at the first meeting to guarantee the date and time selected. The balance of the fee is due the day of the wedding. Q:What makes your service unique and special? A: We believe that the spoken word is very powerful, therefore we like to give couples a choice of the ceremony and words that are spoken on your Special Day. Q: Do you have a standard ceremony or can we custom write our own ceremony? A: When we meet, we have two or three ceremonies to choose from, with the option to “mix and match” parts to make it unique. After we have woven the choices together for the custom ceremony, we will copy and bind the Marriage Ceremony as a memento for the Wedding Day. Q: Do you plan the ceremonies? A: We only perform the ceremony, but we can suggest vendors for all your wedding planning needs. Q: Where do you perform the ceremonies? A: We perform ceremonies all over. We have an Angel Deck in our Angel Garden that we think is beautiful. 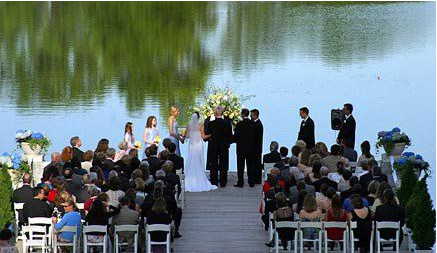 We perform many ceremonies in nature settings; by the lake, in the woods, gardens, in the mountains or on mountain top, by the beach, and even fireside weddings. Other great places are national, state, and city parks, on party boats, hotels, conference centers, golf clubs, art galleries, and even antebellum mansions. Q: Who performs the ceremonies? Contact All-Faith Weddings to take the first step in making this wonderful decision… One of your life’s wonder experiences together. This entry was posted on Friday, March 2nd, 2012 at 7:12 pm by Linda	and is filed under Featured Guests. You can follow any responses to this entry through the RSS 2.0 feed. Both comments and pings are currently closed.